Added to the San Francisco skyline in 1933, this monumental love letter to the city remains an iconic welcome for travelers westbound across the Bay Bridge. 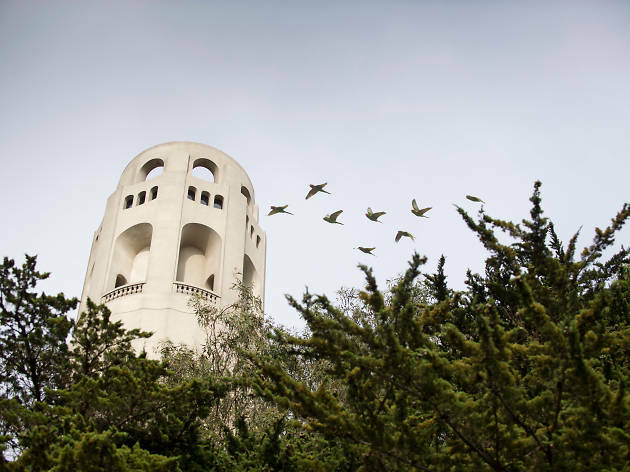 Named for Lillie Hitchcock Coit, a wealthy eccentric whose $118,000 bequest to the city resulted in the tower’s construction, the tapered, fluted tower stands 180 feet tall at the crest of Telegraph Hill. 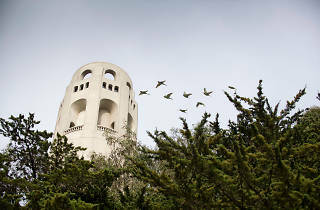 At the top is the tower’s observation deck with 360 degree views of San Francisco and the SF Bay. A rotunda at its base is covered in Depression-era WPA murals depicting not-so-subtle socialist images in scenes of California agriculture and industry painted by over two dozen artists, some of whom studied under famed Mexican muralist Diego Rivera. Observation deck $7 (residents $5), seniors and youth $5 (residents $3), children 5–11 $2 (residents $1.50). It is quite the hike to get here, at least it has been for me every time I go. But the reward is worth it once you get to the top of the tower and take in the 360 degree views of the city. There are also murals along the walls as you make you way up! It's definitely a must-see.